Top Kitchen Design Ideas - C.C. Dietz, Inc. When you remodel your kitchen, remember to include good lighting! 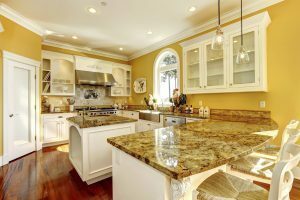 If you happen to be considering a kitchen remodel, there are some important things that you will be very glad you did in your kitchen once the remodel is complete. In fact, the last thing you’ll want is to be one of those homeowners who stand in their kitchen full of regret as they consider what they “should” have done differently. As a result, here are some key components that you’ll want to keep in mind before you begin your next kitchen remodeling project. A key component to a stellar kitchen design is optimal kitchen storage solutions. In fact, many people often underestimate the importance of storage in their kitchens. When you are remodeling your kitchen, it may seem like the design has plenty of storage, but to be honest, you can never have enough storage. At the end of the day, homeowners will find one thing to complain about and it’ll always be storage, that is why making the most of a kitchen remodel means getting your storage in tact. While you could have a great kitchen layout all planned out, but nothing is worth showing off if you don’t have the proper lighting to showcase the new space. In fact, lights end up making a massive difference in making a kitchen really stand out and set a good first impression to your guests. It’s obvious that kitchen cabinets are important when remodeling the space. In fact, they are a key feature in any kitchen. However, there are other features that need to be considered as well. From appliances to trash bins, these little things all combine to make your kitchen a space that you love and actually want to spend time in. This entry was posted on Monday, October 22nd, 2018	at 1:26 pm	and is filed under Kitchen Remodeling . You can follow any responses to this entry through the RSS 2.0 feed. Both comments and pings are currently closed.